My report on the recent march for Charter Schools in NYC and NBC’s Education Nation. Across the Brooklyn Bridge. Photo by Bianca Clendenin. “My school, my choice” was one of the many chants sung out by students…teachers… and their families who are fighting for equality in their education. Tuesday morning on October 8th students, teachers, parents, and many supporters came out to Brooklyn to support Charter Schools in New York City. 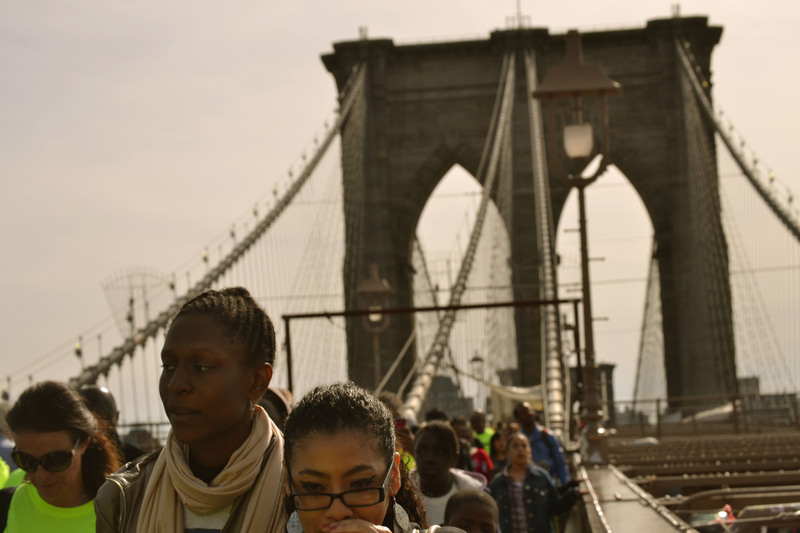 In attempt to have there voices heard…according to NY1 over 17,000 supports walked across the Brooklyn Bridge to City Hall on Tuesday. With the upcoming election in November one of the main topics bought up by democratic candidate for Mayor…Bill de Blasio are Charter Schools and their use of space in public school buildings. De Blasio believes that charter schools should pay for rent. His opponent, Republican Joe Lhota disagrees and was at the march on Tuesday to show support. Supporters of Charter Schools were singing a different tune. To many, Charter Schools are Public Schools and deserve to continue existing in their spaces without being charged rent. In New York City alone there are 183 charter schools in existence. Current Mayor…Michael Bloomberg has been an avid supporter of the Charter School system since he took office in 2002. For this he has been seen as progressive. New York City has been the hub for charter school success stories… For example, KIPP (which stands for Knowledge is Power Program), which I’m an alumnus of their 1st school…Opened in 1995 in the Bronx. The program has branched out both nationally and locally, with multiple schools within the 5 boroughs as well as an elementary and high school. If De Blasio wins in November, this could lead to many of these Charter Schools closing because they don’t have the funds to afford to pay their rent. It can also mean that the dozens of Charter Schools that planed on opening up in the next few months may have to be put on hold. Education has been a hot topic in New York in the last few days. Just finishing up their two-day summit, NBC’s 4th annual Education Nation just took place during the 6th through 8th. Having all kinds of panels filled with educators and supporters…discussed methods on how to better education and to have this dialogue on a national scale. One of the more popular discussions that I was grateful to be apart of was the Student Town Hall from this past Sunday. Moderated by MSNBC’s Melissa Harris-Perry this event gave a telecast platform for students of ages ranging from 11 to 25 to come and speak out about issues in regards to education that matter to them. Personally it inspired me to want to do more. As a recent college graduate and aspiring journalist, I realized being active in some sort of policy or advocacy work is a great way to give back to your community. Without my support from my charter school I wouldn’t be who I am today. This is why I hope to blend my growing interest in advocacy and journalism to get back to my roots and give a voice to folks who need to be heard. We can all agree that education is vital to a thriving society and we need to all work together to provide a better future for our children. Sound off: Do you agree that Charter Schools shouldn’t have to pay rent or do you agree they need to pay up? Remember be respectful in the comments sections. Thanks, B.